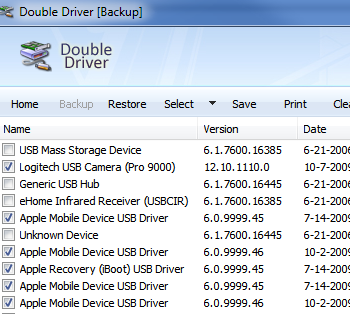 Double Driver 4.0 makes fast and easy work of saving all your drivers. The utility scans your system, automatically detects and selects those drivers that aren't native (i.e. part of the operating system), and lets you back them up to any kind of storage: a USB drive, a network folder, etc. I particularly like the choice of output options. You can save the drivers in a structured folder (meaning each driver gets its own sub-folder), a compressed folder (good if you're saving to, say, a space-challenged flash drive), or a self-executable file (which will automatically restore every driver when you run it). Double Driver also lets you print a list of your installed drivers and/or save the list as a text file. Both could come in mighty handy if you ever lose the backup itself. What I like best about Double Driver, apart from it being free, is that it's a portable application. There's nothing to install; it can run just as easily from a flash drive as it can from your desktop. Ultimately, this is one of those must-have (and must-use) utilities. Take three minutes and make a driver backup. The system you save could be your own.